Another subtly glorious shot from Caleb's 'subtropical noir' series; a portrait of the power of the late afternoon light to steep everything it touches in mystery. 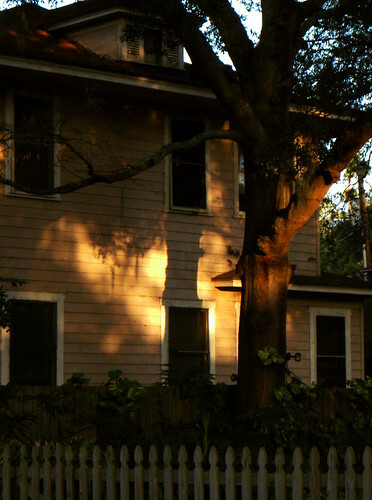 I love the shadows on the house and the reflection in the forward limb of the tree and on the roof of the vermilion-tinted afternoon light. 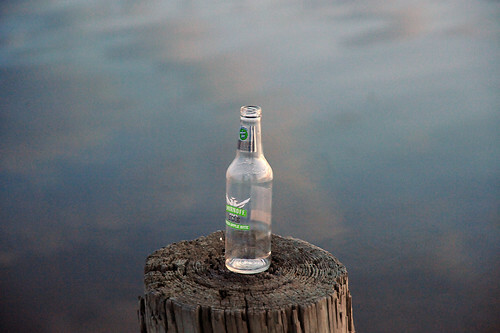 Even a discarded or a forgotten bottle can make art for a photographer who has the artist's eye. 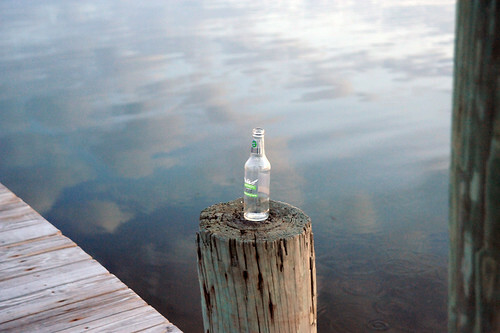 Without the bottle to pull this together, would we notice the reflection of delicately tinted sunrise clouds in the reflected blue of the water or the weathered browns and greys of the dock? The slight unsteadiness of the bottle's position keeps you looking, as does the flash of green in the label (subtly picked up by the post on the right. The one that follows is, of course, the same bottle. I couldn't decide which I preferred so I decided to use both. 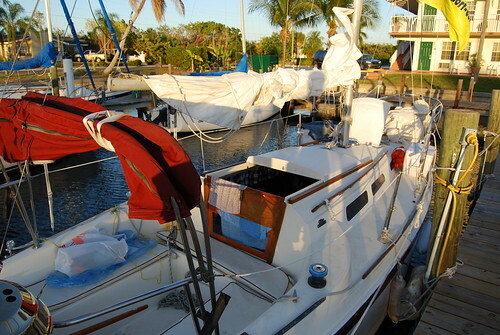 The photographer took these photos in the course of a day of recording her life in Tampa. She took this one and the one after it at sunrise at Davis Island. I do not own the rights to this photograph, but am using it in compliance with a restricted Creative Commons license. Before saving or using it, consult the terms of the applicable license (linked here). 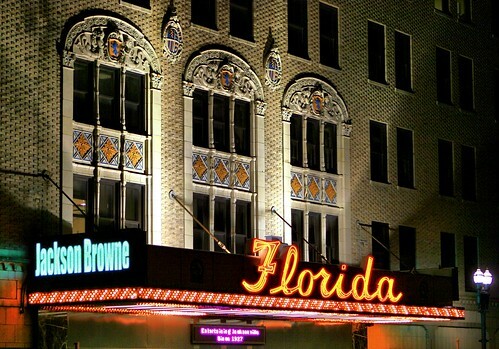 I love photographs of Florida cities that reveal to those who don't know just how closely the beautiful natural Florida obtrudes on, and glorifies, its sometimes stark urban realities. This shot has got everything: radiant sunlight; delicate sunset tones shading from violet and apricot to a translucent blue; a city skyline; a bridge; palm trees, cloud, and boats. Love it. Here is a beautiful night shot by Jacksonville photographer Craig O'Neal. I do not own the rights to this Creative Commons photograph, but am using it in compliance with the terms of a restricted license. Please don't save or use it without first consulting the terms of the applicable license (here). Here's a breathtaking shot of Miami by Ralph Orona: "A wide shot of the MacArthur Causeway in Miami Florida...it reminds me of Miami Vice. All it needs is a White Ferrari Testarossa with Crockett & Tubbs standing next to it." This photograph is used with the express written permission of its owner. Please do not save or download it without first obtaining his permission. You can write to him here. I realize that many people find cityscapes a bit monotonous. But imagine the amazement of someone from the Victorian age: they'd see nothing but fairy-tale palaces, and fairy-tale lights. I'm not sure what it says about us that we prefer to build our cities out of steel and glass towers and are satisfied to have them all look rather similar to one another. 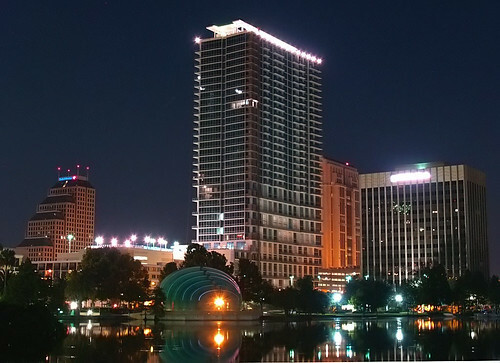 I'm just asking you to focus on this one scene, with its silver, platinum, and celadon reflected in Lake Eola, its satiny dark blue backdrop, and its glass towers dwarfing the trees. 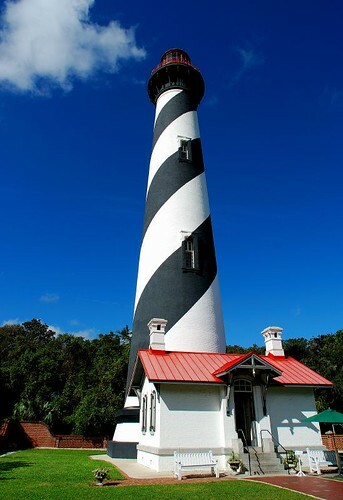 By the way, this is the same photographer who does such wondrous photographs of derelict houses, rusting tin, and lost and abandoned property decaying gently into Florida's rural landscape. 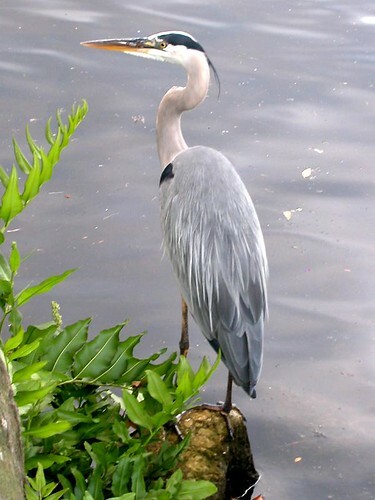 I've posted several photographs of Blue Herons---my favorite Florida bird since a couple of them adopted my family back when I lived in Kissimmee---but this one by Judy Malley shows in perfect detail the beautiful silvery blue of its plumage and the no-nonsense tint of its navy racing stripe. Is he not precious? I do not own the rights to this photograph, but am using it pursuant to a restricted Creative Commons license. Do not save or download it without first consulting the terms of the license. The link to the applicable license is shown here. 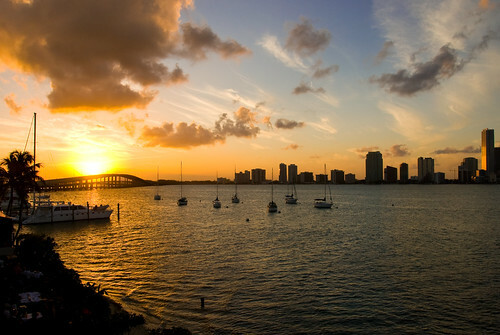 Here's a radiantly tinted shot from the Gulf Coast city of Fort Myers. I love the red awning and the flashes of yellow and royal blue. Magnificent holiday shot---wish I was there now. I really do. 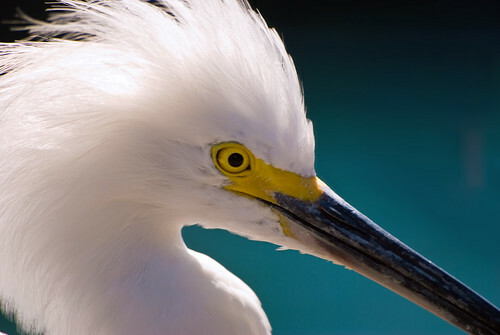 I was mesmerized by the golden eye of this snowy egret set against the blue-green background. Look at the luminousness and delicacy of its feathers, and the streaks of paler blue against the slate-colored bill. Taken in Tampa, it's just an awesome capture and has deservedly won all sorts of Flickr awards and honors. Gorgeous.